Do you get angry if the gearmanager bugs out, and you have a lot of wrong talismans in the fight. 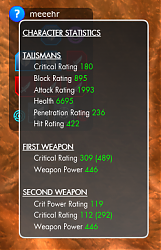 This addon lets you see what type of talisman (DPS, Tank, Heal) you are currently wearing in what slot. Also it will calculate the stats of your talismans and weapons. 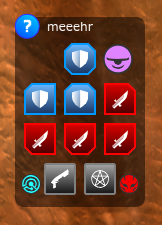 You can also change your target to display the stats of the target. Thanks to CaDom for great ideas and testing.